At times, the Philadelphia Eagles offense looked unstoppable, moving up and down Lincoln Financial Field seemingly at will. They did not pull ahead of the Washington Redskins until there was under a minute left in the second quarter, but they never relinquished the lead after that, winning 34-24. 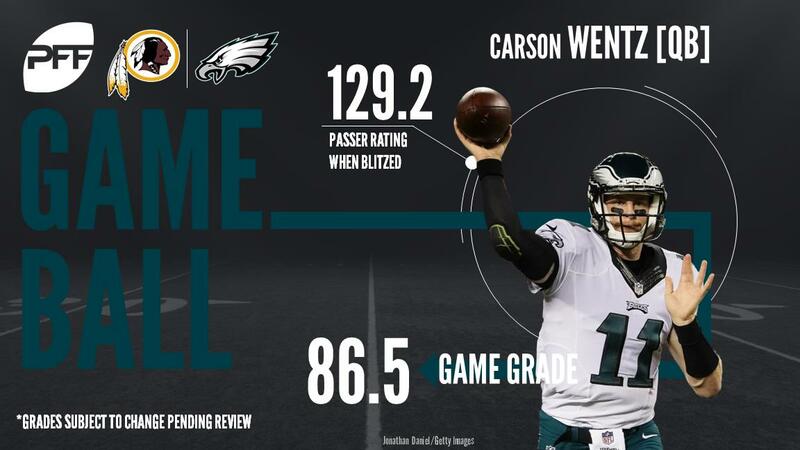 QB Carson Wentz was well in command of the offense, producing not only with his arm, but with his legs, as he was the Eagles leading rusher on the night with eight carries for 63 yards. TE Zach Ertz was instrumental in the success of the passing game, recording five receptions for 89 yards and a touchdown. QB Kirk Cousins was harried by the strong Eagles pass-rushing group, although his final stat line of 23-of-40 for 303 yards, three touchdowns and one interception was certainly respectable. TE Jordan Reed made his presence known by scoring twice, but the overall effort by the Washington offense was not enough to produce a win. Defensively, the Eagles’ Grahams, both Brandon and Corey, led the way and allowed Philadelphia to play with a large lead late. With that, we give you our PFF exclusive takeaways from the contest for each team. Wentz overcame an early interception to earn a great overall grade when it was all said and done. He connected on 16-of-22 attempts without pressure in his face for 259 yards and three touchdowns (along with his interception), earning a 132.4 passer rating on throws from a clean pocket. Wentz also showed off his wheels, earning an elite run grade after rushing for 63 yards, including 42 yards on four scrambles. Ertz’ season long struggles as a run blocker continued on Monday night, as he earned just a 41.4 run-blocking grade (which brings his season long run blocking grade down into the low 30s); he made up for that, though, with his play as a receiver, hauling in all five of his targets for 89 yards and a touchdown. Wentz had a perfect 158.3 passer rating when targeting his tight end. Four of Ertz’ completions resulted in either a first down or a touchdown. Grahams pass-rush grade of 84.3 was tops on his team and he ended the game with three hurries and one hit. The past two weeks Graham has recorded 14 total pressures and looks to be finding a groove. He worked against two competent tackles in Trent Williams and Morgan Moses and was successful rushing the passer from both sides, with two pressures coming from each side. Veteran safety Corey Graham had perhaps his best game of the season, as he notched two defensive stops in the run game and tallied an interception that was thrown right to him when Kirk Cousins was hit, affecting the throw. Graham had a coverage grade of 81.5, which was tops on an Eagles team that did surrender 303 passing yards. Kirk Cousins played most of the second half with a makeshift offensive line due to multiple injuries sustained up front. He was hurried 13 times and sacked four, but played a decent game considering the heat. When kept clean, he was excellent as he completed 22-of-23 passes for 226 yards and two touchdowns. His play dropped under pressure, as he completed under 50 percent of his throws for only 77 yards on 17 attempts. We saw flashes of the 2015-16 Jordan Reed on Monday night and he displayed what he’s capable of when healthy. He caught all 8 of his targets and ended the evening with 64 yards receiving and two touchdowns. Reed has caught 81 percent of his 32 targets on the season with only one drop, Washington will hope he can stay healthy and build on his solid performance Monday Night. Breeland committed two defensive holding penalties and also missed a tackle in Monday night’s game, but for the most part he was a blanket in coverage. Wentz targeted Breeland’s man in coverage four times and completed zero passes, with Breeland breaking up two of them. Breeland is now tied for fourth among cornerbacks with six pass breakups this season. Brown finished his night with a good 82.4 run-defense grade while also earning average grades as both a pass-rusher and in coverage. He led both defenses with seven total stops (a solo tackle resulting in a “loss” for the offense) and this was his third game of the season where he didn’t miss a tackle. Brown also earned three pressures on the day on nine pass-rush snaps, including his first two sacks of the season.